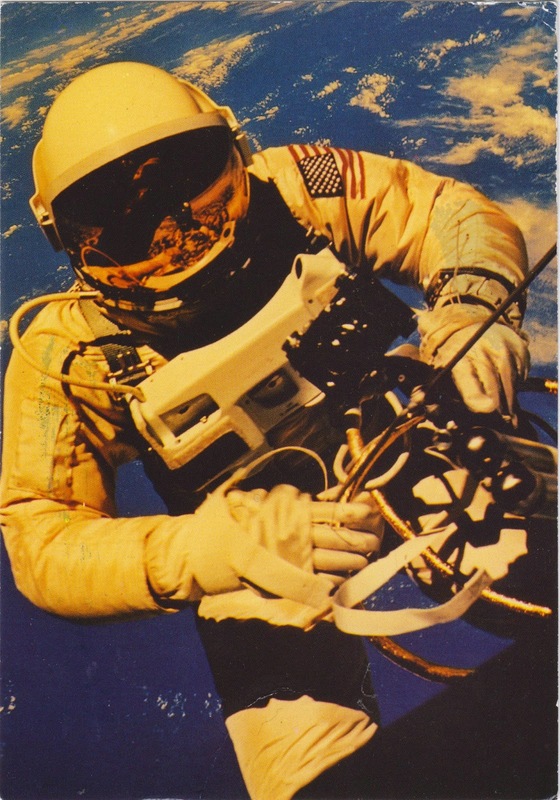 Postcard US-3263789 from North Carolina shows NASA astronaut Major Edward H. White II who made the United States' first spacewalk on June 3, 1965 during the third orbit of the Gemini IV flight. The extra-vehicular activity (EVA) started at 19:45 UT (3:45 p.m. EDT) when White opened his hatch and used the hand-held maneuvering oxygen-jet gun to push himself out of the capsule. White was seen on the card backing away from the Gemini spacecraft 120 miles or 193 kilometers above the Pacific Ocean northeast of Hawaii. The space walk lasted 23 minutes, ending over the Gulf of Mexico. The photo was taken by commander James McDivitt.